With every prepinted background purchase you also get two FREE Hub, or Mini plate decals! NOTE: KTM OWNERS. You backgrounds are more difficult to design and have a higher risk of complications due to KTM's multiple model and year differences. For this reason your price is slightly higher than other makes. Also, because KTM side plates include a rear fender the price will be higher than the plastic price listed. KTM Bolt-On Backgrounds add $84.95 to the order. We will call you to confirm this should you place an order with plastic for a KTM bike. Please note that the product images is only an example. The series sponsor may be different than what is illustrated. We will use the correct sponsor when your order is printed. If you do not see your specific model please feel free to click on the chat module for assistance. Our "Factory" font is the same as "Impact" font set forth by the 2018 D37 Number Plate Rules for custom printed backgrounds. The traditional D37 "paper"style font will no longer be available for custom printed backgrounds. Why do we charge more for GP? We charge more because in 2013 the Big 6 series introduced a multi-color banner bar which consumes more time, material, and labor (we screen print not inkjet print). We hope you understand and enjoy your product. A minimum of 3.5" tall number must be maintained which may affect where you name is positioned, especially with headlamp models. All two-loop riders must use black numbers on white backgrounds. All one-loop riders must use red numbers on white backgrounds. (D37 Desert Rule Book) If you are a Grand Prix or Enduro Rider then we will ignore this option. If you are a desert rider and do not make a selection then we will default to BLACK numbers. We are not responsible if you fail to select the correct number color. All Grand Prix backgrounds are to be solid yellow backgrounds since 2018 rules. 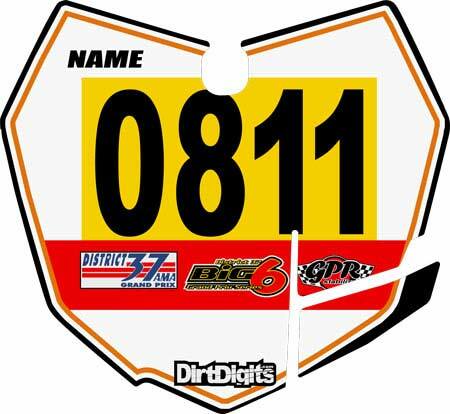 Add aftermarket number plate plastic to your order and we will mount your preprinted backgrounds for free. Polisport plastics are a quality made and affordable alternative to OEM plastics. NOTE: Some models may be extra or unavailable. We will contact you should there be any issues with plastic pricing or availability. A "Must Have" for installing with the best results. Soft, yet firm premium felt allows you to apply sufficient and even pressure without scratching the glossy surface of your decal. Will last for years of use.